Off season MTB Training… Its winter time and usually around this time of the year is when many riders start freaking out about training and trying to figure out what they should be doing now so that they’ll be able to ride the bike better next season. But too often, riders over think their off-season MTB training and spend way too much time and energy doing things that aren’t relevant to improving their bike riding. I have good news! For most riders (of course, there’re always exceptions), this stuff is a lot simpler then most people think! Working in gym and on the road bike during the off-season is great, but nothing will give you the gains that putting in the work on the bike and improving your bike skills will do (and it’s way more fun then going to the gym!). In it, Jared talks about how he trains for Enduro Racing and how it differs from the training that he used to do for gravity oriented racing (DH and 4X) and BMX. This is pretty relevant to most, if not all, MTB riders who want to excel on their bikes and want to have the fitness element, the bike skills…all the pieces of the puzzle in place as much as possible. But, first, who is Jared Graves and why should we care what he thinks? 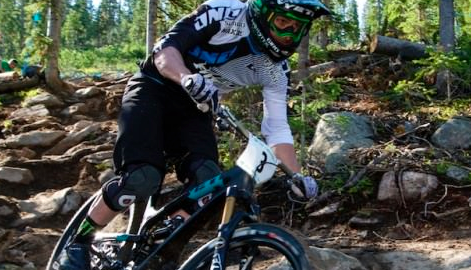 If you had to pick the greatest all-around MTB racer of all time, Jared Graves would be a pretty good first choice. He’s had success (including a couple world championship titles) in all MTB disciplines: DH, 4X, XC, and, most recently the rather new discipline of Enduro Racing (He was also an Olympian in BMX). Now, just because a racer is super fast, it doesn’t necessarily mean that they are also a great teacher, or coach, or even that they know what the heck they are actually doing that makes them so good at what they do!!! There are all kinds of examples of athletes that are phenomenal at their chosen sport, but couldn’t coach their way out of a wet paper bag! However, I have spent a little time around Jared, and from what I’ve seen first hand, heard from others, read, etc., I’ll say that Jared is one of those athletes who does know his stuff. He’s a smart guy and very critical about every aspect of his riding (and extremely talented and fast). Also, he’s currently focusing on Enduro Racing*** (if you’re unaware of what MTB Enduro Racing entails, read the description at the bottom of this post) which in my mind, and in the minds of many others, is back to what True MTB Riding/Racing is all about. Neither one of the above MTB racing disciplines (admittedly oversimplified explanations) are very similar to what most of us really ride as everyday mountain bikers which is getting out on fun, challenging, accessible (or not) trails on very capable, modern mountain bikes. Pedal to the top, pin it to the bottom!!! Have FUN!!!! 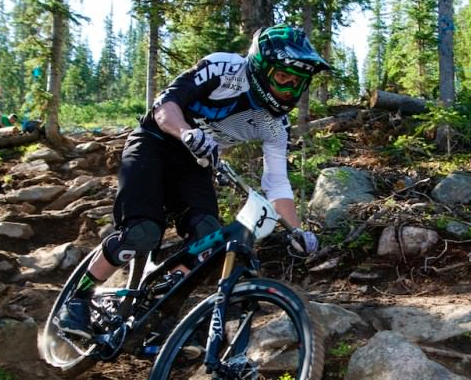 And this is why Enduro Racing is so borderline nauseatingly popular right now. It’s racing your fun bike on fun trails…the same type of riding most of us do on a regular basis: Mountain Biking!!!! So, now we have Jared Graves, an extremely successful and knowledgeable racer/rider who is excelling at a racing discipline that is very similar to what we, as regular mountain bikers, do and want to excel at…and what’s he do for training to be the best in the world at mountain biking? He rides his bike!!!! A lot!!! Is he in the gym doing a ton of top-secret cutting edge workouts? Is he putting in super-human miles on the road bike with some crazy road-training-tweaked-to-enduro-racing-program by some road guru/coach? Not according to him and not as far as I can tell (this is also consistent with a lot of other very successful enduro racers). Here’s a guy that is paid to be in the best shape possible. He has all the time in the world to be in the gym/on the road bike/stationary trainer… and while he does spend some time doing these things (for muscle imbalances, aerobic base…just to switch things up and not burn out, etc.) his time with these is, relative to many MTB Racers, seems minimal. When it comes down to it, he’s riding his bike, working on SKILLS, looking for speed. I couldn’t agree with this more!!! Students ask me questions all the time about training for MTB riding and what they should be doing, and I always emphasize that riding your bike is going to be the most important thing you can do for your bike riding!!! For some riders, gym work and building strength—for speed and/or for injury prevention, etc.—will be pretty important. For others—if, say, lack of fitness is their weakness—some road bike/trainer time may be the best way to deal with this limiter. But, either way, we’re all mountain bikers, and spending time on that mountain bike and doing things right while riding is a crucial part of riding well–and, I believe should be top priority–no matter what your fitness level is and no matter what your goals are. I’m definitely not saying that off-the-bike training is a waste of time. It has its place. Working hard in the gym, putting in time on the road bike as well as other common off-season MTB training techniques can offer large benefits. Resistance training to retain lean muscle mass, stretching and massage, yoga…all these things are great and perhaps should be worked into your program. But, if your goal is to be a better Mountain Bike Rider in difficult terrain, then focusing on improving your bike skills—with very, very, very rare exception—will do you the most good in all areas of riding: safety, fitness, speed…you name it! Most of us have limited resources when it comes to time and energy, so we need to put our effort in where it will do the most good. What do you really want to focus on? Some beginner or recreational riders may say, “Dude, that’s Jared Graves you’re talking about. The guy already has killer fitness. I need to get in shape, first, so that I can do these things…” There is a point there. However, as long as your fitness is at a level that allows you participate safely in riding, then bike skills (and the very important on-the-bike specific fitness, that will come when working on bike skills) need to be priority. Being efficient, smooth, and effective on the bike; understanding how to read a trail, where you need to be making decisions and finding lines, seeing solutions to trail sections with adequate time to be able to be proactive and put the bike in the right place; understanding the how and why of proper riding position and weight placement; understanding how your body works optimally in an athletic manner and allowing it to do this while working in accord with the design of the bicycle; understanding how to properly manipulate the bicycle…these things are all crucial to riding the bike well and you’re simply not going to learn them in the gym. These bike skills are crucial to a beginner and novice rider just for safety purposes. And, when these skills come together, the rider’s efficiency will go through the roof and this is huge in riding the bike successfully: even great fitness won’t do you much good if you’re wasting a ton of energy because you’re doing things wrong on the bike, or worse, crashing a bunch. Too often I find that riders are looking for fitness and training programs that they can do off of the bike—and commit a substantial amount of time to—when they really should be focusing on what they’re doing on the bike in order to get the biggest gains in their riding. For a professional rider who can afford to put all of their time into their training—a gym program, road riding, etc.—when done properly, can be a huge asset. But for most riders, if you’re putting that much time into “training”, then you’re not working on your bike skills. Bike skills are what will make you smooth and efficient, safer, more under control, more confident…and faster, when it comes to riding in technically challenging terrain. There is so much going on when riding an MTB on the trail that it is crucial to get the proper movements, proper positions, proper techniques, down to default and ”muscle memory”. You’re not going to be able to analyze and contemplate and figure it all out when it’s really” go time” so you have to put the time in first so that the skills are there when you need them. This is true not only for a multi-time World Champ like Graves, but also for a recreational or beginner rider. Of course, there will be exceptions to this in the wide world of MTB: if you’re goal is to do well at a 100 mile dirt road race, then sitting on a trainer for hours at a time will probably do you more good then understanding what proper descending position is, why it’s so important, and where it should be applied on the trail. But, again, we’re focusing on riding technically difficult terrain (Mountain Biking!!! ), here, and 100 miles of dirt road isn’t very technically demanding. If we flip it around, however, you can ride on that trainer and build yourself some awesome cardio fitness, but that won’t keep you from going over the bars on a steep drop-off because you don’t have any technical skills. Another example: if you don’t understand proper climbing position and technique, you’ll be fighting your own mass, the bike, and the trail as soon as the climb gets steep, loose, and nasty, and you’ll be wasting so much energy that even if you do have a high level of fitness, you’ll still be cooked after struggling all the way to the top. But, your priority still needs to be bike skills if you’re interested in becoming a decent mountain bike rider. If you burn yourself out over the winter, and you show up in the spring as a totally ripped gym-rat, but without riding skills and no energy or motivation to go out to get them…you didn’t do yourself much good as far as your riding is concerned. And here comes the MTB Skills Coaching plug: if you have a proper understanding of what needs to be done, skill-wise, on the bike, then good!! Go for it! Work on it! However, most riders don’t, or at least they have a bunch of questions, and this is where formal instruction and coaching comes into play. Take some instruction and learn what and why correct riding technique is what it is. Learn how to practice and improve upon these skills and techniques so you can move your riding to the next level, whatever that may be. Work on making correct technique your default instead of drilling bad habits into your game. **** An Enduro MTB race is essentially a race timed over what are called “test stages” and these will be primarily downhill sections of trail. These test stages will usually be anywhere from 5ish to 20ish minutes in duration. The test stages are connected by “transition stages” that usually involve climbing the elevation required to get to the top of the test stages (these may be hours in duration). Sometimes these are timed, but usually can be ridden at a fairly leisurely pace. There may be 2 -5ish test stages per day, often with hours of riding required on the transition stages in between the test stages. Usually, Enduro races are multiday events. The test stage times are cumulative and that’s what determines the winner. And, for all intents and purposes, the racers have to be self supported with no outside help, and can only use the parts and tools that they choose to carry with them. So, picture three to five of your favorite rides. Do all of them in one day; you’re timed on the downhills (which is cumulative over the entire race) and you can’t have any outside support (with repairs, etc.). And do that for a few days in row. That’s basically Enduro racing.